I was wondering though if you wouldn’t mind posting a link on your site and possibly facebook website as well for world give day. My girls, who are 3 and 1 right now, have a terminal genetic disorder called I-cell disease. I-Cell disease is an extremely rare terminal genetic disorder. Children with I-cell disease can not break down storage material that builds up in their cells and because of that, they have build-up of this material on their bones, their hearts, their respiratory system…etc. 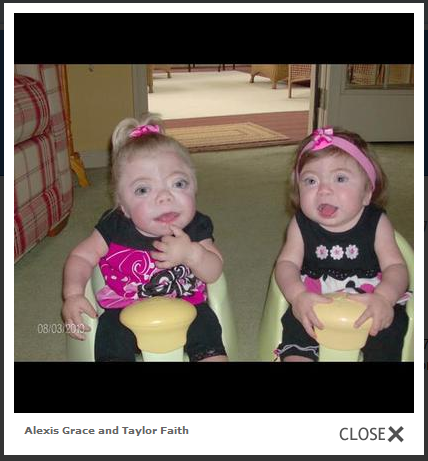 The doctors only gave Allie and Taylor up to 10 years at the most to live. However, we know that God has the final say. So it is with humility that we are reaching out to others for help. The girls are in need of somethings such as a wheel chair ramp for the van and one for the house that insurance will not cover. If you wouldn’t mind posting a link to their fundraiser site for World Give Day, that would be amazing! Thank you and either way, I am grateful. Thank you so much Dian! We appreciate it. God bless! Lauren Giunta » You’re very welcome, I tweeted it and posted it on FaceBook as well! Please send me your dvd of the girls at your convenience. Our prayer group, Caring Heart, has been praying for Alexis and Taylor for several years now. They are definitely a big part of our prayer family. Let me know the cost of the dvd and also your address so I can send you a check.